Initial symptoms of stomach ulcers How are stomach ulcers diagnosed? What ulcers look like What are the different types of stomach ulcers? Observable behavioural signs of equine ulcers characteristically result from the pain caused by the erosion of the tissue. Horse tries to find a position to reduce abdominal pain. What are the different types of stomach ulcers? Many times, signs of ulcers in horses include clenching and grinding of teeth, depression, unwillingness to train, lying down more, stress at feeding time, ear flinching, or stomping hooves during girthing. Equine ulcers cause damage to the lining of the stomach; therefore, your horse may become more agitated at feeding time and be reluctant to eat or drink. This may lead to additional signs that your horse is suffering from ulcers, including dull hair coat and weight loss. Pain and decrease in appetite often result in diminished performance. Colic is, essentially, abdominal pain. Recurrent colic is persistent instances of colic over time. Ulcers commonly cause recurrent colic. “Recurrent colic” is generally defined as three or more instances of colic over a few months or a year. Colic can have many causes, including parasites, sand accumulation, or gas, but ulcers are a common cause of mild colic symptoms. Do not hesitate to call your veterinarian to report the colic’s duration and severity and to discuss the possible cause. Clinical signs and response to treatment can offer circumstantial evidence that your horse has ulcers, but gastroscopy (stomach scoping) is the only way to confirm the diagnosis of stomach ulcers and to evaluate their severity. There is no correlation between the signs and the severity of ulcers. Some horses exhibit very few signs but have severe ulcerations, whereas others show many signs but have less severe ulcerations. Stomach scoping involves passing an endoscope (a small camera) through the horse’s nose all the way to the stomach and the beginning of the small intestine to see the stomach lining. This requires the horse to be fasted, so that the stomach is empty, and lightly sedated to help pass the camera more easily. 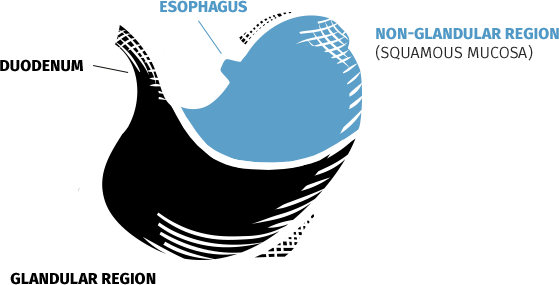 Stomach ulcers are graded based on the level of progression. Stomach lining is intact. No appearance of reddening. Stomach lining is intact. Areas of reddening, yellowing or thickening. Stomach has small single or multiple ulcers. Stomach has large single or multiple ulcers. Stomach has extensive ulcers, often with areas of deep ulceration. Your horse’s stomach is divided into two distinct regions: the non-glandular region, or squamous mucosa region, which covers approximately one-third of the equine stomach; and the glandular region, which covers the remaining two-thirds of the stomach and contains glands that secrete hydrochloric acid, pepsin, bicarbonate, and mucus to aid in digestion. Equine stomach ulcers can develop in both regions of the stomach, but the disease process, risk factors, and treatment response for glandular ulcers is different from those for squamous ulcers. The only way to determine the location of a stomach ulcer is by stomach scoping. To confirm diagnosis, it is therefore critical to perform gastroscopy to identify the location of the stomach ulcer and treat it accordingly.